One of my favorite places to visit has been Changunarayan since the first time I rode on the back of a motorcycle up a dirt road to the village. It was like stepping into a story book. There were monkeys and an ancient, outdoor museum with idols and shrines so old and yet so beautiful. As I walked up the steps to the ancient temple the merchants were quite friendly without being overly pushy like the ones in Thamel, Kathmandu. It was lovely after getting there, but it was actually a dirt road for a couple miles. That was in 2011. In 2012 I had another day helper who suggested a day-trip to Changunarayan. "Oh, no! I can't do that road!" "No, Ama," he explained. "There's a road now." I loved this sacred, ancient village even more with a new, paved road. That was when I met Sanjay and Kamal, a couple of thangka artists with a little thangka school. They were so friendly and kind we soon became good friends. They always treated me with such kindness and respect and would come over to cook a meal with me or to take me to Kathmandu. Since then they've become family to me, in more ways than one, but that's another story. Kamal and Sanjay gave me this lovely thangka as a gift. I began inviting my guests and tourist friends to meet these lovely guys and create their own souvenirs. They have a 3-day thangka painting course that everyone loved doing. It's still only $7 for each 3 hour lesson and we provide a 25% discount on our rooms for those taking the course. Many tourists spend weeks learning this art style and since our guesthouse is legally Kamal's, we can provide a nice package. The temple was so beautiful. After passing the merchants and craftsmen along the steps, the temple had long buildings, patis, that created an enclosure for the many temples and idols inside. It was a nice energy shift as I came through the tunnel entrance. 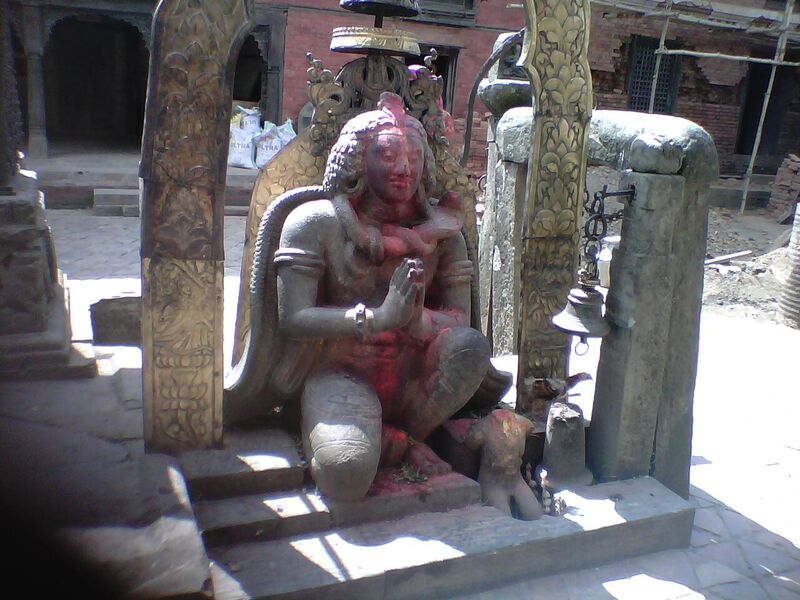 This ancient temple is the oldest Hindu temple still in use in Nepal. There are many festivals celebrated in Changunarayan each year, so be sure to check the Nepali calendar before you book your flight. Here's one coming soon. There are also many ancient ponds and random shrines you'll discover along the way, almost as if stratigically placed, as you scout out the area. The Nepali have no understanding of trespass, so if you cut through somewhere, as long as you don't damage anything, you will be met with a smile. There is a pine forest an INGO planted several years ago, which is quite nice and we have several trekking routes with lovely 1-day destinations. I always liked buying souvenirs in this village. The prices are quite a bit better than in Thamel and you can often meet the artist or craftsman. Another of the friends I met here is Furba. He has a woodcarving shop and can even teach this craft with lessons. They aren't quite as popular as the thangka lessons, but are quite a unique piece of art to take back home. The wood is a local, fast growing tree that is not endangered. It's also fairly light compared to many woods, so if you see one you like it might fit just fine for your flight home. One of the most popular gods in this village is Bhirab, the incarnation of Shiva birthed from his anger. Well, Bhirab is probably the oldest god still being worshipped because the ancient Newar people brought him here from ancient Babylon or possibly even before. Furba gave me one of these masks as a gift and I was pleased to put it on the wall. Well, the energy in the flat completely shifted and was much calmer. I mentioned it to my day helper and he told me Bhirab 'eats' anger. Although he looks fierce, if you are open to eastern spirituality, you might like his energy. If you meet one of our local trekking guides they will tell you about many of the epics from the Hindu sacred scriptures that happened right here in Changunarayan. In fact, this is a village of miracles and myths. If you go up to the temple you'll find a huge rock that is halfway to becoming an elephant. As the legend goes, the craftsmen started making the statue in his rock carving shop. But when he went the next morning to work on it, it was gone. He found it up at the temple and brought it back to continue his work. The next morning it was gone again and that's where it remains, up in the temple courtyard. 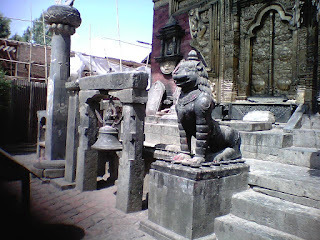 Bhairab slayed a demon right here, posibly on our hilltop, although it was most likely at the site the temple was built upon. Shiva lived an incarnation in a village just down the hill from Changunarayan. We have a museum where you can learn more. Come through the temple and go down the steps at the back. Don't worry about having to climb back up; there is a road that goes around it. You'll come to the hilltop where there are a couple of benches to catch the sunset or views of Kathmandu and tips of the Himalayas. Watch the falcons soaring by, swarms of parrots, sparrows, silver crows and local birds. Star View Guest House sits here overlooking the hilltop, so we get the fresh air, gentle breezes and nice views. If you have a place to stay, don't worry. You'll enjoy the hilltop and you're welcome to come to Star View to fill your water bottle at no charge. We have an RO filter system. If you come to Nepal I hope you'll take time to come to Changunarayan. It will be one of the highpoints of your time in Nepal.